Although many drive straight past Aix-en-Provence (13 Bouches-du-Rhône, Provence PACA) on the A8 autoroute there are many good reasons to detour into the city. Not least is the connection with Cézanne, a native of the city. In the heart of the city is a Cézanne walking trail marked by studs in the pavement taking in key locations from his life. The principal art gallery is Musée Granet, but it also worth getting a local bus or lengthy walk to Cezanne’s studio at 9, avenue Paul Cézanne, which is very atmospheric and has been kept as it was when he was alive. The other great link to Cézanne, and worth visiting even if you are not an art lover is the Montagne Saint Victoire – to the east of the City – a range of spectacular and beautiful mountains which often featured in Cézanne’s paintings. Beyond Cézanne the city itself is worth a visit – an elegant centre with the imposing Cours Mirabeau main avenue, and plenty of shopping and restaurant opportunities. Just outside the city to the west is a little known aqueduct at Roquefavour at Ventabren – although only built in the 19th Century it is an impressive stone structure carrying a canal to Marseille and is the largest stone aqueduct in the world at 83 metres (nearly 300 feet) high and is a French national heritage site. 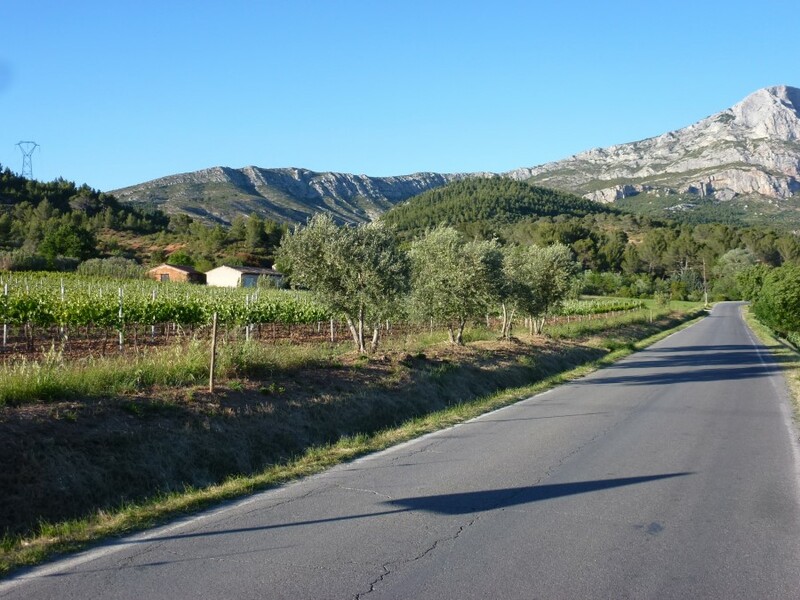 Montagne Sainte Victoire is also a designated wine appellation – Côtes de Provence – Sainte Victoire for red, white and rosé Provence wines. In midsummer there is an internationally recognised music Festival (Festival International d’Art Lyrique d’Aix-en-Provence). 3- 22 July 2019 in Aix-en-Provence. There are many places to stay in and around Aix-en-Provence (hotels, Bed & Breakfast, apartments) including Les Lodges Sainte-Victoire, a hotel set in 5-hectare park with vineyards and Olive trees, The property was built in the 18th Century and includes spa facilities, 2 swimming pools and a gourmet restaurant. There is even a regular bus service from the village to the centre of Aix-en-Provence!